Not something that we eat every day, but a wonderful occasional treat, especially when you can buy fresh cod or other white white fish and local potatoes (which have never seen the inside of a supermarket warehouse or articulated lorry). We buy Braunton potatoes, grown within 10 miles of Ilfracombe, from Norman’s independent greengrocer in Ilfracombe High Street. So simple to make too: mix the cooked white fish and mashed potato, adding salt, pepper and a few parsley leaves, then mould into a long roll. 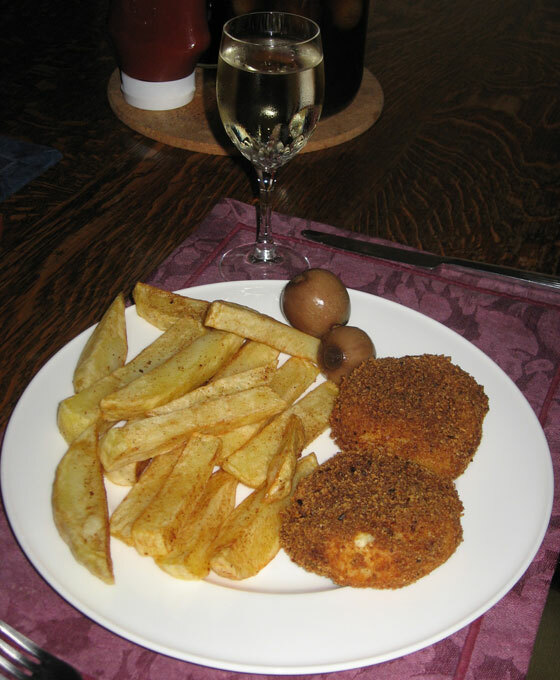 Slice the fish cakes, dip in beaten egg and coat with home-made breadcrumbs. We use the end slices of a loaf from our baker’s, The Pantry in Ilfracombe High Street, bake them in the oven and grind in a blender. The chips are also made from local potatoes, peeled and chopped thick. Deep fry the fish cakes very hot for five minutes or until ready, then keep warm in the oven, while frying the chips for 15-20 minutes. The fish cakes are deliciously light and fluffy inside and crisp on the outside. I eat mine with home-made pickled onions, but choose whatever accompaniment you prefer. We chose a fruity Regatta from Stanlake Park, so refreshingly free of the chemical after-taste (and headaches) of mass produced wines, as the perfect white wine on this occasion. A potentially dangerous meal if eaten too often and if you’re not careful when deep frying, but lovely to enjoy as a treat with common sense and an otherwise healthy diet. Posted in food & drink. Tagged with chips, fish cakes, home-made, Ilfracombe, pickled onions, robzlog. OH LOVELY GRUB! How I miss English Style simple cooking. Stop showing pictures like that or this old Pom will leave Australia and come home! Home-made pickle onions? Marry Me please!